Rosenthal Dinnerware is one of those brands, when I see it in a shop that engenders the feeling (for me) that I am looking at high quality, contemporary design at its very best. I have always had this feeling about Rosenthal, even before I was in the business. I used to work next to a Rosenthal shop in Knightsbridge, London and I often peered to look inside with a curious longing, leaving my hot breath on the window. 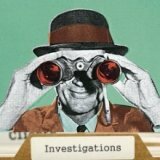 How did they create that image? Yes, everyone needs a break when they are starting out. 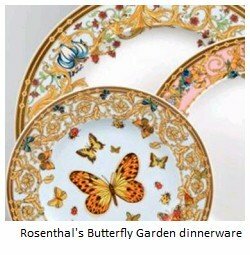 Rosenthal Dinnerware - Founded 1879 Selb, Germany by Philipp Rosenthal Snr. In 1879 Philipp established his own decorating works at castle Schloss Erkersreuth. We all know how successful and hot Rosenthal is today. However, everyone needs a break. In their case it was the humble ashtray. Obviously, being Rosenthal, it was not-so-humble. In 1886 the cigar ashtray was their first mega-commercial success and paved the way forward. An iconic design, the Rosenthal cigar ashtray looks as if it could have been designed yesterday. By 1916 the firm had engineered yet another major commercial success with their Maria range. Another product area from Rosenthal close to my heart, for obvious reasons is their early to mid 20th century figurines. Wow! is all I can say. 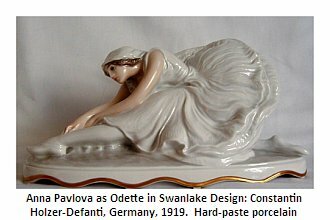 For me Holzer-Defanti's figurine of Odette from Swan Lake is just about as beautiful as piece of ceramic art can get. It is simply exquisite in every detail from the top of her beautifully positioned head to the scalloped edge of the gilded base. This period was a very rich period for Rosenthal - a company which really proves the point I make frequently that ceramic products are, in reality, an example of Art as business rather than just business. Several top artists and designers worked with Rosenthal in the 20th century and they really did a good job - not just lip service. 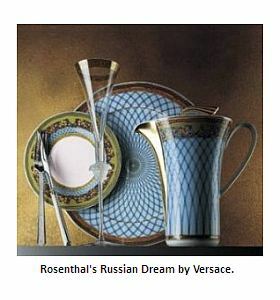 You just have to look at the graphic images on the right (showing current live auctions on eBay) to see the rich array of work the artists and designers of Rosenthal dinnerware have produced over and very long, consistent period of time. 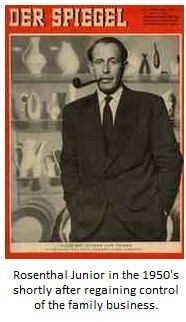 For example, Otto Koch worked for Rosenthal from the 1920's right through to the 1960's. Koch was both a sculptor and painter and early on at a young age became the leader of the famous Rosenthal studio Art Department of Bahnhof. He later became the head of the whole factory. Philipp Rosenthal was quick to see merits in strong, creative people and liked to surround himself with an able and trusted group. 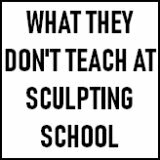 About Koch, he said he had an incredible eye for quality detail, but was always caring toward staff and engineered an immensely fruitful training program. Dr Wilhelm Wagenfeld, the "Bauhaus" exponent was foremost in creating modern 20th century ceramic production methods for Rosenthal. He won many awards in his long and illustrious career. The first specifically named Art Department was created in 1910. But What of the Founder Philipp Rosenthal Himself? I have read some fascinating folklore about this amazing person (I am mainly citing an interview I read with Philip Rosenthal Jnr in the Milwaukee Sentinel - Mar 13, 1979). 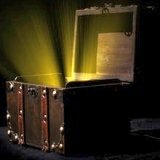 How much is historical fact, I don't know, but the stories are great. As a young man, in the late 19th century, Rosenthal Snr apparently travelled to America and became a cowboy. He was such a notorious character he came to the attention of writer O. Henry and was included in his books. On returning to Germany he followed in his own father's footsteps and began to decorate china. Not only was the Rosenthal dinnerware name successful, but in 1908 Rosenthal bought the Thomas ceramics company (founded in 1908). Thomas was always run as a separate concern and also did very well. There are various versions as to why, but by the 1930's the family had, sadly, been made to relinquish all equity shares in the firm - so it was Rosenthal in name only. The family had Jewish roots but were not practising - in fact, Philip Jnr says as a youngster, he had no idea his families past roots and was quite pro-Hitler. 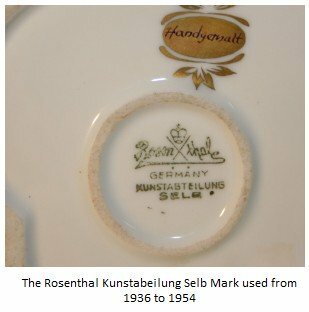 The fascist regime, ironically, were pro-Rosenthal china and on his day to day travels during the War, on the German State Railway, Hitler likely ate off Rosenthal dinnerware plates. Rosenthal's son (Philip Jnr) had being sent away in 1934 to be educated in England with the family likely anticipating the possible coming dangers. In his own words, Philip Jnr had no interest in ceramics or his father's company (in fact resented it as being too "little and small"). In the War, Rosenthal Jnr fought on the side of the Allies in the French Foreign legion against the Nazi's. He was captured, but escaped to England where he helped in the War effort by translating and writing German. Then, after the war, Philip Jnr returned to Germany with a change of heart about his dad's business. Lucky for Rosenthal, I say. By 1950, Philip Rosenthal Jnr. had discovered an interest in the china business and joined the firm his father had founded as advertising manager, later winning back 11% of the shares in a lawsuit and taking control of the company, and living in the original Rosenthal castle. Rosenthal Jnr says something quite interesting and profound about the way his father's company had always approached the design element of their business - and if you think about it it makes sense. Rosenthal says ceramic design from a production company, to have any worth has to be the expression of artist of the time, for the time. In other words, any reference to or recreations of past periods or copies of past glories, by default have to be impoverished in terms of design (and therefore of less value) unless you are putting an entirely new spin on a particularly rich influence. Rosenthal Jnr believed that the decline in the larger china firms throughout Europe, the UK and the US is due to a complete cultural shift where young people were not versed in an appreciation of fine china. This was, he feels just a cultural shift in civilisation in the latter half of the 20th century. In 2000 Hutschenreuther, the famous old German porcelain maker was bought by the Rosenthal name, although, by then, Rosenthal itself had been bought by the UK's Wedgwood Group. 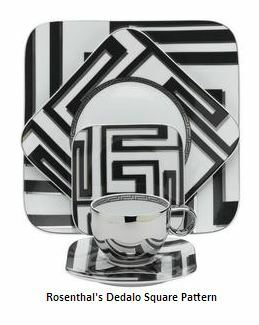 The later part of the 20th Century saw Rosenthal dinnerware accumulate and innovate even more, but in 1997 the Wedgwood group managed to acquire majority shares and success quickly introduced the fine bone china Versace collection - a modern classic. Versace ranges include Meandre, Medusa, Russian Dream, Hot Flowers, Tabletop, Barocco, Butterfly Garden, Hot Flowers and La Mer.